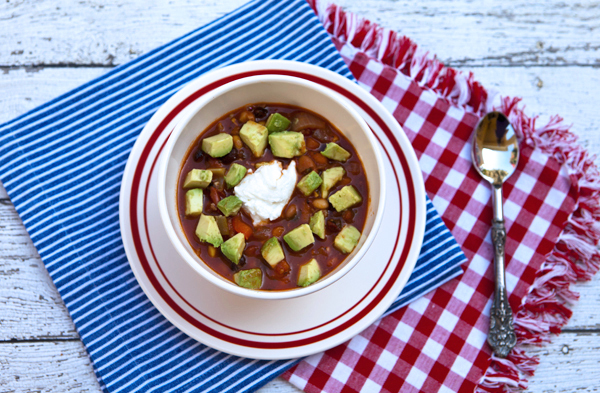 I am always looking for new tasty ideas for my weekly soup or chili. I like to include as many vegetables, grains, and/or beans as I can to create a hearty filling dish, and if I am including meat, my choice is usually either ground turkey or chicken, or turkey sausages. I recently made this chili dish using both chipotle peppers as well as fire roasted diced tomatoes which really gave the chili a southwest flavor. 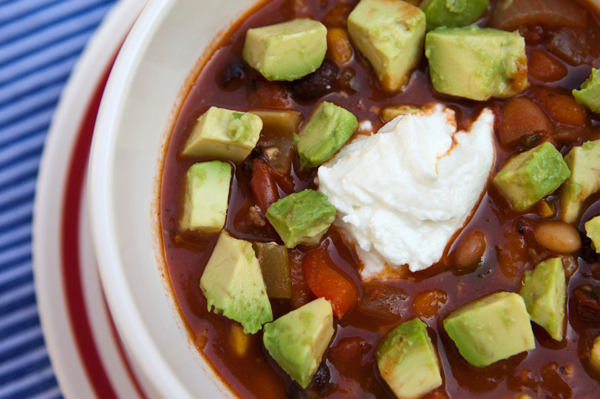 To garnish this dish, we like to add a dollop of fat free Greek yogurt (or low fat sour cream) and some diced avocado. This chili freezes well, so I often double the batch, then divide it up into individual meals before I freeze it. Chipotle in Adobo are chipotle peppers that are sold canned in tomato sauce and add a real depth of flavor to Mexican recipes. As expected, it can be found in the the Mexican section of your grocery store. A little squeeze of citrus really perks up almost any soup or chili, so do try it. Beans are an inexpensive fat-free source of protein that are rich in folate, B vitamins, and iron. Onions contain Potassium, fiber, and folate as well as the flavonoid quercetin. Garlic is thought to help prevent cardiac disease, lower blood pressure, and reduce cholesterol levels. There is a limited amount of meat used in this recipe as the beans and vegetables fill the void creating a filling, fiber rich meal in a bowl. In a large heavy saucepan, add the olive oil and chicken meat and cook over medium heat until the meat is no longer pink and is beginning to brown. Add the onions, celery, and carrots, and continue to cook until the vegetables begin to soften. Add the garlic and chipotle peppers, and chipotle powder if using and cook an additional minute or two. Add the 3 cans of beans, tomatoes, tomato paste, chicken broth, seasonings and parsley and mix well. Cook until mixture begins to boil, then reduce heat to a simmer, and cook for an additional hour until thick. If stew thickens too much, add additional water as needed. Add the lemon juice, and stir to mix well. Serve in individual bowls with choice of toppings.